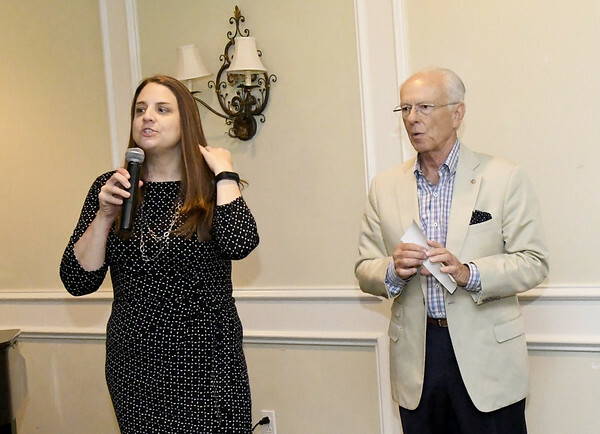 Community Clinic Executive Director Stephanie Brady talks about the services her clinic provides for the uninsured before receiving a $10,000 grant from the Joplin Rotary Club on Thursday at Twin Hills Golf and Country Club. The Rotary presented seven grants totaling $15,370 to the clinic, Wildcat Glades, Watered Gardens, Aspire, Life Choices, Circles and Pro Musica. Also pictured is Rotarian Charlie Keeter, center. Money for the grants was raised during the club's 16th Annual Charity Golf Scramble.